Building America’s largest private real estate development in history would be a tricky proposition whether or not it was taking shape over an active rail yard in the middle of the densest city in the country. 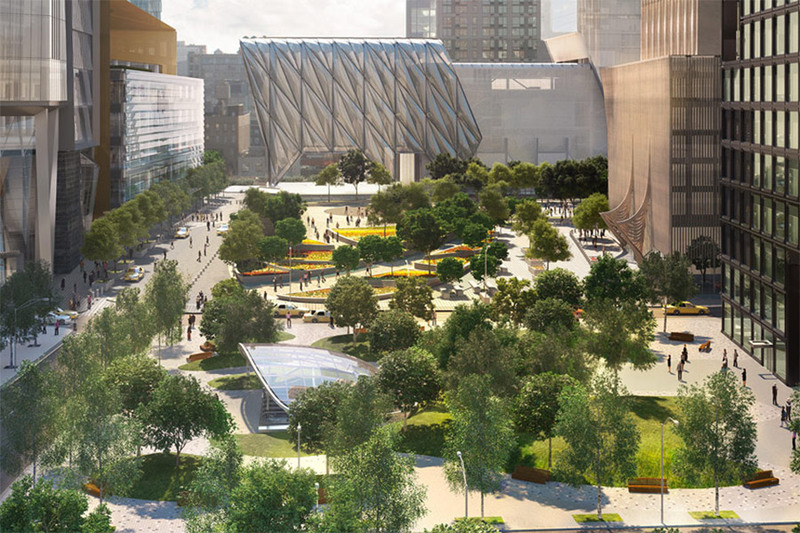 But, of course, that is exactly where Hudson Yards—the mega development with those superlative bragging rights—is taking shape. To support the 17-million-square-foot project, Kohn Pedersen Fox (KPF), alongside Thornton Tomasetti, designed a massive steel platform (video below) that caps the rail yard allowing trains to move below and towers to rise into the Manhattan skyline. After years of failed attempts to build at the site, the project finally broke ground in 2012. Today, the platform is expanding horizontally and the first glass tower, also designed by KPF, is nearing completion. 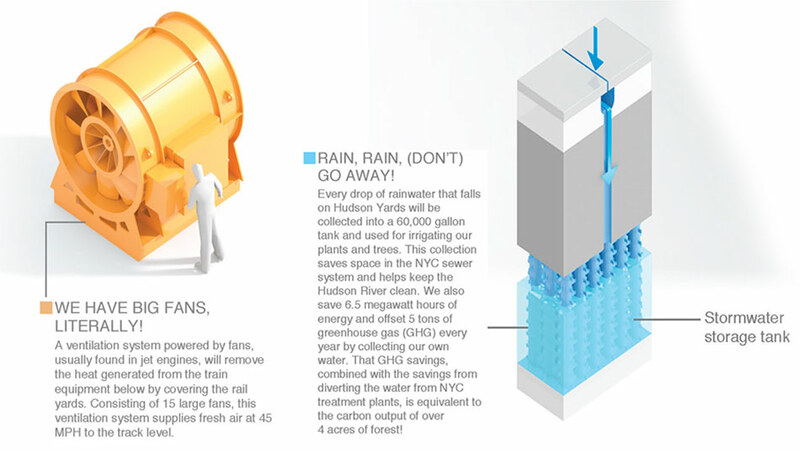 Planting a forest of skyscrapers above the rail yard has obviously required some engineering ingenuity, but planting an actual forest—or at least 200 trees—at Hudson Yards is no easy task task, either. To ensure that all of the trees, flowers, and plantings in Hudson Yards’ 4.5-acre “Public Square” flourish, landscape architecture firm Nelson Byrd Woltz had to solve a tricky equation of its own. Since the green space sits atop the new platform, the firm created a special soil to provide necessary drainage and nutrients for the plantings. 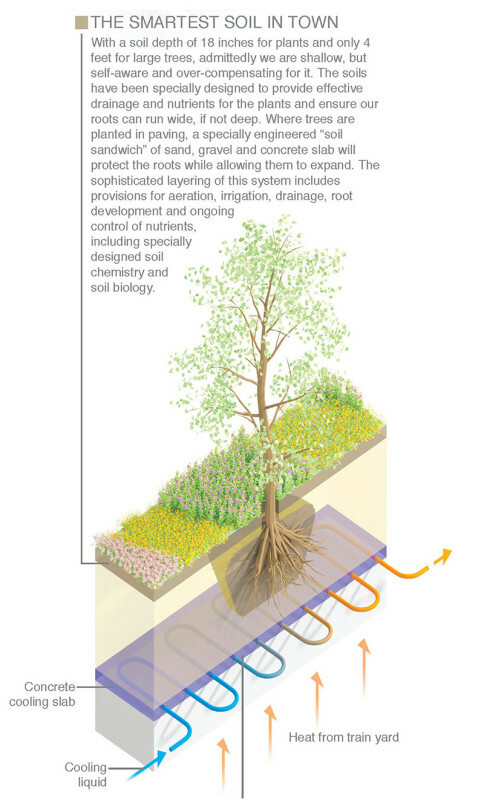 There is also a “soil sandwich” of sand, gravel, and concrete slab to help trees’ roots expand horizontally. 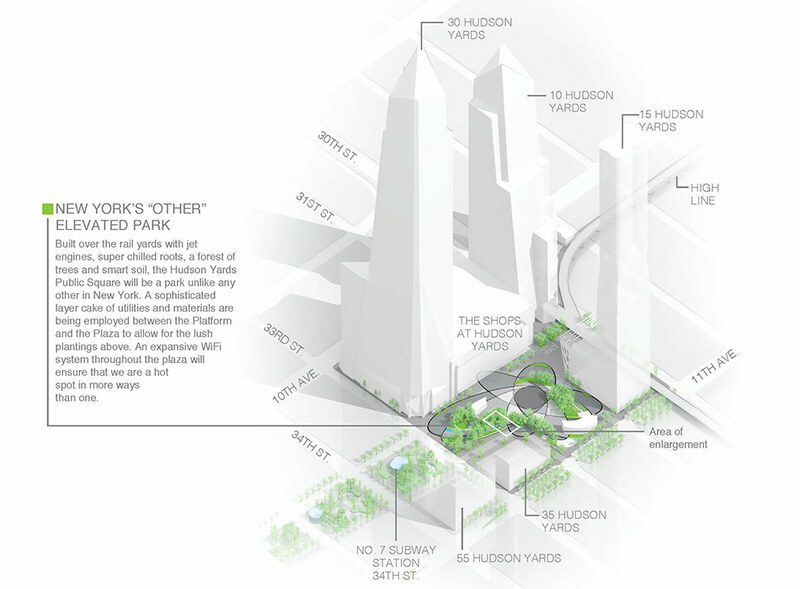 In the mix, plans also call for a rainwater collection system that will irrigate the space by pooling “every drop of rainwater that falls on the Hudson Yards Public Square”. Er, maybe not every rain drop will be collected but we get the idea. 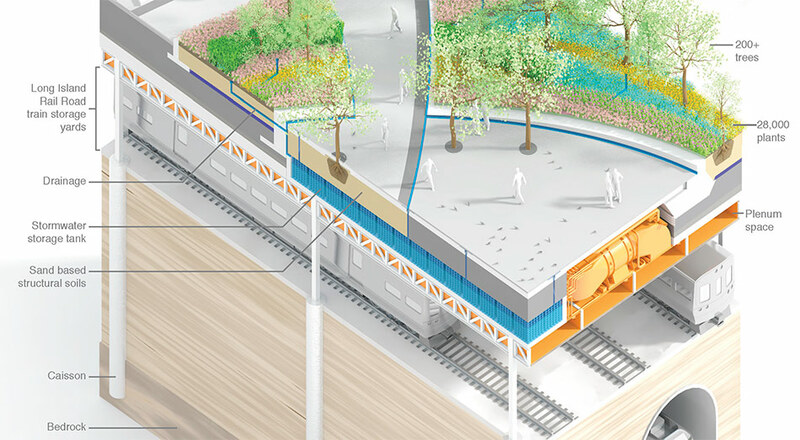 There’s another hidden challenge for sustaining plant life in the Public Square lurking just beneath the surface, as well: the heat rising from train tracks below. That heat, if left alone, would essentially cook the roots of any plants sitting above it. To keep the trees and plants comfortable, coolant is being pumped into the concrete slab. There are also 15 jet-engine-sized fans to further dissipate the heat. The site’s developers—Related and Oxford Properties Group—are celebrating the space as a great new public amenity (it’s right there in the name: Public Square). But while the space is open to the public and can be used for cultural events and movie screenings, it’s pretty clear that it is designed to be a money-maker for the development. The Hudson Yards’ website boasts that the Public Square can be used for “marquee events” like “signature product launches” and “brand installations.” You can also expect plenty of models during Fashion Week, which will relocate to the complex’s Culture Shed. 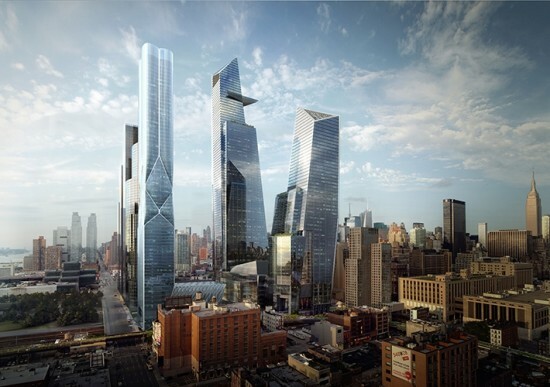 Speaking of money, the day after the Public Square plan was revealed by the developer, the Independent Budget Office projected that Hudson Yards will cost the city an additional $368 million through 2019, bringing the price tag for the entire project to $947 million, as reported by DNAinfo. The city has provided $3 billion in bonds for the project along with the 7 train extension that will service the site. 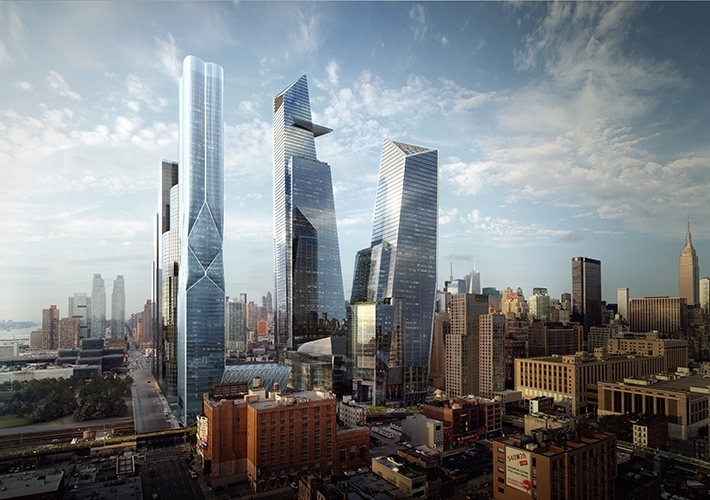 Revenue from residential and commercial tenants at Hudson yards was supposed to offset the cost, but that hasn’t happened just yet.